A man who attacked a couple and their teenage son after they stepped in to help "a woman in need" has been jailed. The family went to help the woman after she was slapped by Patrick Murray, of Alderwood Walk, Cheetham Hill, as she sat in her car outside their home. The 65-year-old fled but returned, armed with a plank and helped by two others, and attacked the family. 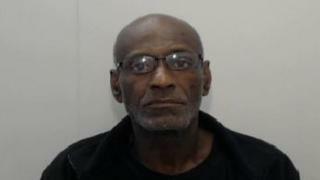 He was sentenced to four years two months in prison after admitting affray and assault at Manchester Crown Court. A 17-year-old boy, who helped Murray and cannot be named for legal reasons, was jailed for for 18 months for the same offences. Another man involved in the attack has yet to be identified, Greater Manchester Police said. A force spokeswoman said the family went to the woman's aid after "hearing the commotion" as Murray opened her car door and attacked her on 12 June 2018. After the intervention, the 65-year-old fled in a van, before the woman left. Ten minutes later, as the family stood "chatting in the garden", Murray and the two others returned. He was armed with a plank of wood, while the boy carried a machete and the man had a baseball bat. The couple's teenage son was hit with the bat "with such force that it broke into pieces", the police spokeswoman said. He was not seriously injured, but his father's head was then slashed with a machete before the three attackers fled. Speaking after sentencing, Det Con Lindsay McHugh said it was "a horrendous attack on an innocent family". "No-one should be subjected to such a terrifying ordeal in their own home and what they experienced is sickening," she added.